... and shipping packaging shows uHat (can’t find the micro symbol on phone keyboard) confirming the new name. When I had a RPi 1B+ did try a similar TV Stick, but experienced power issues and picture lag. The OS was Raspbian Wheezy. Might be rpi fault or tuner fault? The hat does DVB-T2, HD. Not either, the TV Stick was OK on W7 PC, whilst the RPi was working AOK !! Do you get the yellow lightning bolt on the top right of your screen? Is the header for the μHAT aligned correctly with your RPi? Which RPi gets the problem? Is your "RPi3" an original RPi3B or a newer (and more power hungry) RPi3B+? The 3B+ won't run on a 2A supply it needs 2.5A. I'm having a spot of bother with my new toy. Installed on a Pi 3B running Stretch fully updated with tvheadend & kodi installed. 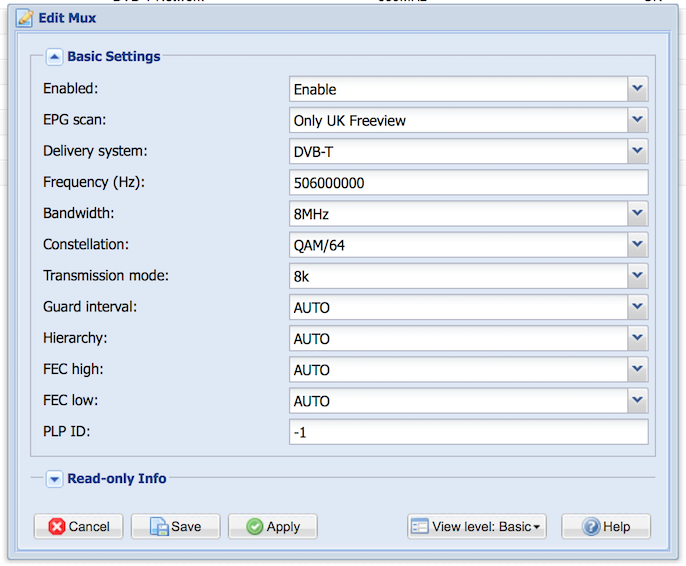 The tvheadend wizard pretend do a channel search but fails to find muxes on 2 out of 6 channels and only the DVB-T2 (DTG6) muxes on another channel. Result: only 42 services out of over 100 available. I have several TVs and devices around the house and they are all happy to find everything that is on offer from my local transmitter - Midhurst at Bexley Hill. in fact the signal from Midhurst is sufficiently strong that I could almost get a good picture with a piece of wet string hanging out of the aerial socket! Maybe the signal is too strong for the front-end of the uhat? To sumaries: tvheadend fails to find any DTG3 muxes on channel 55 & 56; it finds some DTG8 muxes on channels 54 & 59; fails to find any DTG8 muxes on channel 50. The services it does find have dreadful sound/vision sync when watched in the web browser of the iMac I use to run the setup. The picture also pixelates at random. So not a very successful project thus far. Any suggestions as to how to get the full channel search to work? Edit: I've just realised that the channel list that tvheadend pulls up for Midhurst is way out of date. It makes no mention of channels 29. 33 & 48 where most of the services reside. I'll have to learn how to add channels & muxes manually. It doesn't seem very intuitive though. Edit: 16:50 OK, found my own salvation! I edited the file '/usr/share/dvb/dvb-t/uk-Midhurst' to reflect the current channel situation and the tvheadend Wizard now correctly finds 124 services on 12 muxes. Edit: 24-Oct 12:14 OK all working fine. Downloaded the LibreELEC pared-down OS image ( https://libreelec.tv/downloads/ ) which I copied to an 8GB uSD card. Married the TV Tuner to a RPi Zero W and configured the tvheadend to use my local transmitter (Midhurst). Had to do a lot of editing of muxes etc to get all the services working. But all worth it as I could use the system to replace my old Tivizen tuner which ceased working when the company went belly-up! Using Kodi on my iMac to watch live TV - yes I have a TV licence though I'm now eligible for a free licence. There are a few advantages to old age! Last edited by Smudged on Wed Oct 24, 2018 11:24 am, edited 2 times in total. My problem is that I am using a humble Pi Zero W with the Hat but viewing the video elsewhere (eg on a Mac). Problem is that the video is horrendously slow and stops and stutters. I think the "Watch TV" video player on the web interface performs transcoding at the head end (Pi). That is to say it will re-encode the stream as one of the formats offered in the drop down list. Very handy if you are running this on a pentium but not a tiny Pi Zero W.
However, when I hit the 'i' icon in the EPG it offers to play natively on my Mac and I have no issues. Problem is the HD channels are not listed in the EPG. Anyone know why that may be? I feel I'm almost there with this. If I can get it to work it will be a massively useful thing in the house. Is there any way to just get all these streams listed in something like VLC? What channels can you get from freeview anyway? anything worth watcing?